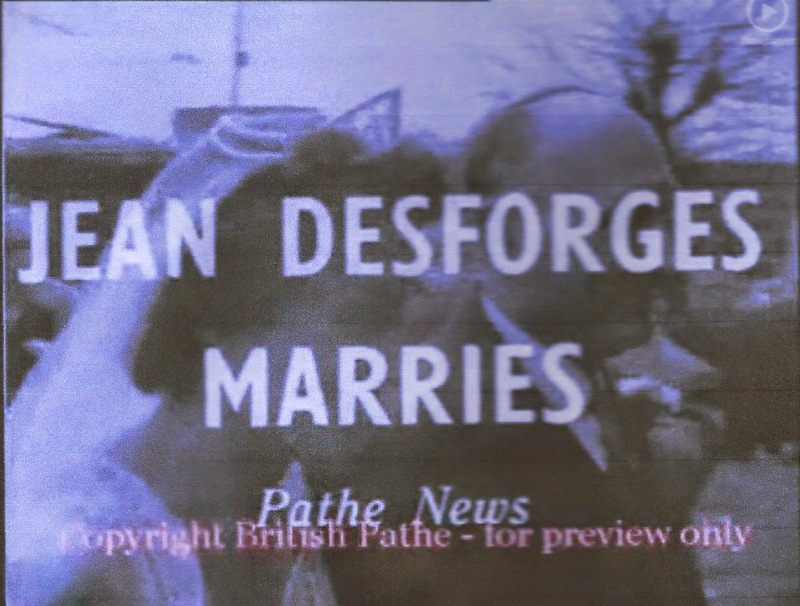 Pathe News was THE film newsreel medium in the days before the widespread television ownership in Britain. Filmgoers would usually get 8 - 10 minutes of news clips, as part of the bill on most cinema programmes, each week, until the 1960s. Fortunately, much of the back catalogue survives and is available to view (or purchase) via the internet. Seven clips, focussing on Forest Gate, or locality-related incidents, remain and viewing them today can be a real eye-opener for a modern audience. By Pathe News standards, this is lengthy (14 minutes and 34 seconds), but it provides a fascinating picture of the school and our locality, just 45 years ago. It is grim viewing, but a reminder of how far we have progressed in educational provison over the last half century. 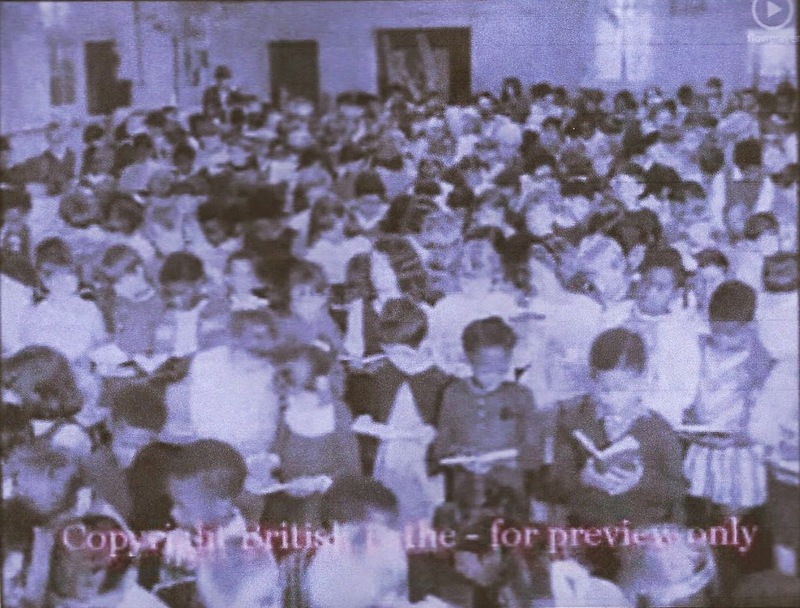 The film shows squalor and over-crowding in the school (which housed both Godwin primary and Woodgrange infants at the time). Both heads talk about the difficulties the overcrowding presents. There are many shots of youngsters (most of whom will be in their mid 50s now), at study, in assemblies and the canteen, and at play. The multi-racial nature of the school population is obvious, and commented upon by the narrator. Interestingly, the predominant non-white grouping would appear to be Afro-Caribbean; the film being shot before the mass expulsion of people of Asian heritage from East Africa in the early 1970s. This was shot at the old skating rink on Woodgrange Road, on the site of what was the Public Hall and cinemas, later became the Upper Cut club, and is now a railway ventilation shaft. 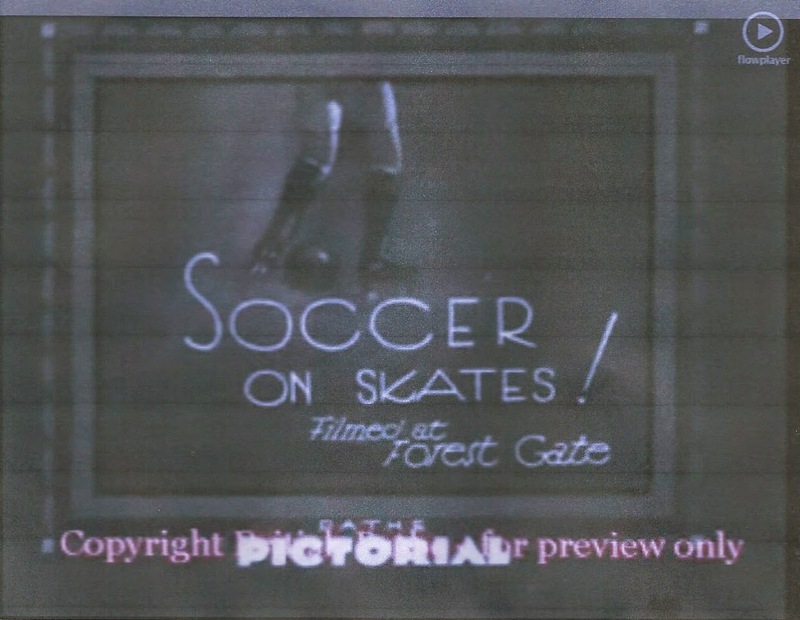 The film shows various clips of two teams of girls playing football on skates, a "craze that was about to sweep the nation", apparently! The commentator displays the jaunty and sexist tone of many newsreels of the day. Although the film is relatively short (1 minute 47 seconds), it shows some action from a women's football on skates match, watched by a lively crowd. Soccer on skates: "craze, sweeping the nation"
The Forest Gate skating rink was a prominent one in the UK from the 1930s until the 1950s and we hope to feature it more prominently in a future blog on this site. 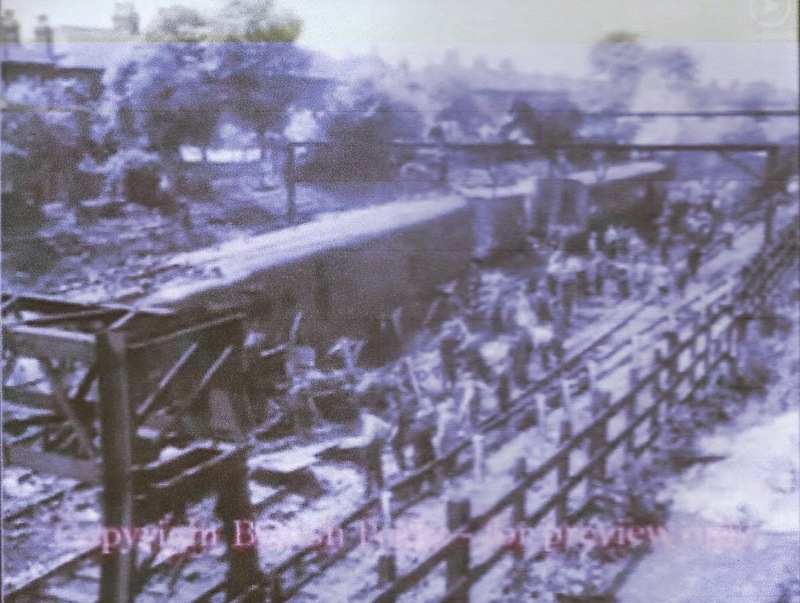 There were minor casualties in a train crash in Forest Gate in 1953, and this short (1 minute 43 seconds ) clip shows the rescue effort, with various shots of the wrecked train (with a Gidea Park destination notice at the front) and goods wagons involved in the smash. An interesting view for railway and E7 enthusiasts, alike! Jean was a local games mistress and international athlete who married Ron Pickering (later to be TV athletics commentator) at Emmanuel church in 1954. This very short clip (49 seconds) shows the couple emerging from the church to an adoring crowd of well-wishers. This would have constituted one of Pathe News' quirky, human interest items. It is the only one in this article shot in colour, and is about the Pathe's standard length (1 minute 57 seconds). 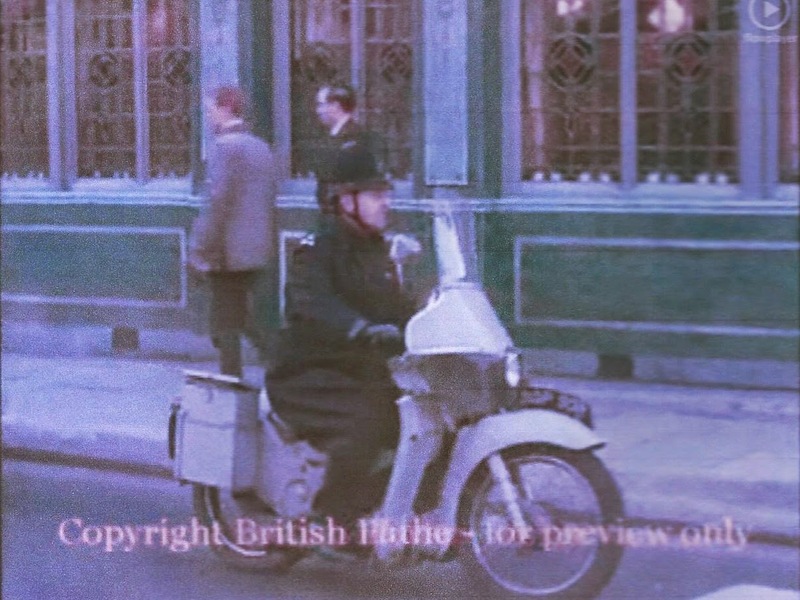 Various scenes show Forest Gate Police Constable Bert Slight on his police moped, going about his work as an accident inquiry officer; he asks an old lady some questions on her doorstep. We then see several shots of Bert at his multifarious hobbies. A pleasant, light hearted look at some of the district. There are two silent films about this local VC hero, buried in Manor Park cemetery, to whom we have referred on a number of previous blogs. The first concerns his funeral, in 1916 and the second the unveiling of his memorial in Manor Park cemetery in 1920. This shows the navy funeral procession for John Travers Cornwall, VC on 29 July 1916. It is silent and 1minute 23 seconds in length. 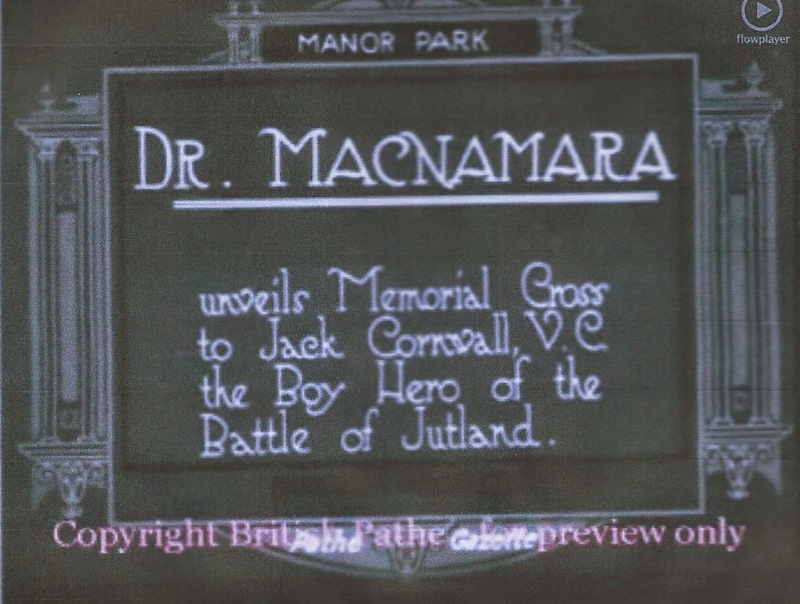 The film is of Dr. MacNamara (local MP) standing next to the memorial draped in a Union Jack flag. A crowd of people in mourning dress listens as he addresses them, including a woman holding a baby. The flag is removed, revealing the memorial to John Travers Cornwell, the men in the crowd remove their hats. The film is silent and lasts 1minute 38 seconds. These films, individually and collectively, feature precious clips of local social history. We would be delighted to hear from anyone appearing in any of them, and would love to highlight any similar films that may be in existence. A year ago we published one of our most read, and certainly commented upon, blogs, on Forest Gate pubs - past and present (see here). Well, a year is a long time in supping, and much beer has flown since then, so it's time for an update on where things stand. And the news isn't, overwhelmingly great. Below: we record a success, welcome an addition, rectify an omission, regret some closures, update some wobblers, report some progress and dig up some history. The undoubted pub success of the last year has been the opening of the Forest Tavern, on the site of the old down-at-heel Railway Tavern. Bought by the London chain of gastro-pub, shabby chic specialists, Antic, eighteen months ago, the pub opened last September, to much local acclaim, and affirmations that gentrification was finally arriving in Forest Gate. It's a pub and chain that listens to its customers. So, bit by bit has added a restaurant, an interesting range of bar snacks, entertainment nights (Forest Gap, comedy and quiz nights), a monthly record fair, a good, tasty range of real ales, ciders etc. and most recently a (rather uninspiring) back garden. There's no piped music or intrusive TV, so lots of animated chat and conviviality, from an overwhelmingly white, middle class clientele. The food menu hasn't perhaps lived up to its early promise, and those concerned with the pub's management (and profit and loss accounts) must be a little disappointed at the apparent lack of take-off of the restaurant. But, the venue has certainly become a favoured meeting place, and big hit with so many who have been frustrated at Forest Gate's lack of a decent pub, over the years. The bravest initiative over the last year, however, has undoubtedly been the roar-away success of the Wanstead Tap. Stuck out of the way (352 Winchelsea Road - round the corner from the Holly Tree - see below), in a railway arch (surrounded by car repairers), with trains rumbling overhead, and no beer on tap. Madness; a guaranteed failure by someone who didn't have a clue; a certain money loser, failure, bankruptcy inducer and early closure. How wrong! A real welcome awaits from a delightful mine host and friends and relatives; coffee shop and toy and game-packed environment for those with toddler care in afternoons and a huge and absolutely delightful range of bottled beers and ciders in the evenings for drinkers. Here's a beer seller, who loves his job and is ever on the look-out for new stock to add to his already very impressive range. And at night, a fascinating range of wide-ranging activities to entertain the patrons. Great supper nights, once a fortnight, with food supplied by Forest Gate's gourmet chef, Michael Sanders, timely film showings (Mrs Doubtfire the night after Robin Williams' death), fascinating talks by authors and music makers with local connections, or stories to relay. If you haven't been - don't delay. But not because the much predicted closure beckons! Lots of flack for a key omission from last year's listing - the Holly Tree on Dames Road. Although (like the Wanstead Tap, above) not in Newham, it is in Forest Gate, and there has been a pub on the site since at least 1870 - so mea culpa. Here's a quick addition to last year's listings. It's a popular pub, offering simple hot food (with a 4 star food safety certificate)and a range of entertainments, including sports on TV, Karaoke on Fridays (from a small raised stage area), a pool table and some gaming machines. There's an outside garden, which overlooks Wanstead Flats and hosts popular barbeques in the summer. It even has some simple children's play equipment. One of the best features of the pub is the large conservatory extension, offering pleasant, airy views of the Flats. It was almost inevitable that there would be losers and closures over the year, following the national trend. And so it has been. Within four months of last year's article, the Live and Let Live (or "The Live", as it was generally known) died and is currently boarded up (see photo), with no sign of a new licensee, or even new use, in sight. A real shame, not only to see a pub with history go, but one in what is rapidly becoming the scruffiest, most unwelcoming parts of Forest Gate. 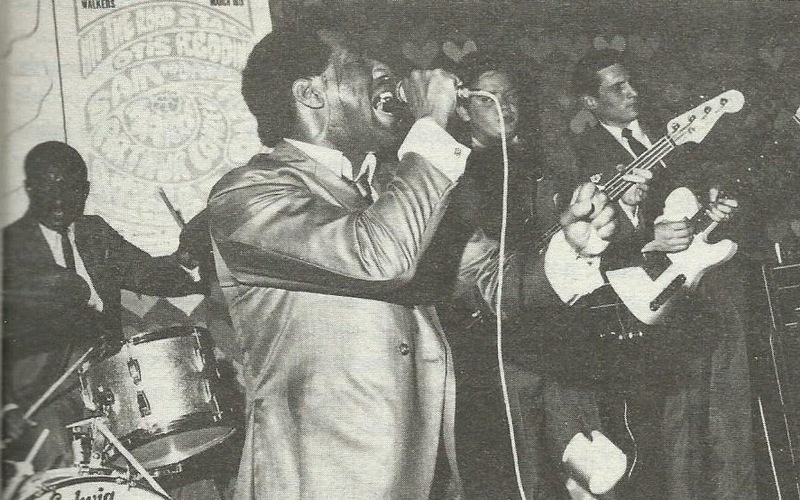 Last year, we reported on the (then) recent closure of Temptations, which had operated as a nightclub on the site of the old Wagon and Horses on Romford Road. It was closed, following complaints of rowdiness from neighbours. There was always a possibility that it could have re-opened as a pub. But no - it has followed the trend running in former pubs such as the Princess Alice - a little further down the road - and become and Asian restaurant. It looks smart (as the photo shows) and has only recently opened, so it's very much, watch this space to see how it prospers. But, one more local pub closure confirmed. As predicted last year, the most likely victim of the Forest Tavern's success was the Fox and Hounds, almost next door, on Forest Lane. And so it has proved to be. Enterprise (a company that leases pubs to landlords/tenants) has recently posted details on its website of the availability of the pub, as a new business challenge for somebody. Their website puts its best spin on what's on offer "This is a real 'heart of the community' traditional 1930's public house, with an original U-shape central bar, tons of original features, fireplaces, warmth and charm. It also benefits from a rear paved ('secret') garden, and well maintained three bed private accommodation." The annual rent is £35k, with additional estimated costs of £16k p.a. It must be a big ask to clear £1,000 per week "profit" from the pub, before making a wage! Watch this space, for a forthcoming closure or very serious competition for the Forest Tavern. The old Freemason's Arms (called Simpsons from the 1980's until around 2000), 324 Romford Road was boarded up at the time of last year's pub round up. It still is, albeit with a scaffold-supported roof cover now. It is not clear what will happen to this building, but a re-emergence as a pub seems highly unlikely. In summary then, Forest Gate now supports only 6 pubs: Forest Gate Hotel (Sebert Road) , Forest Tavern (Forest Lane), Fox and Hounds (Forest Lane), Golden Fleece (Capel Road), Holly Tree (Dames Road) and Hudson Bay (Upton Lane) , and one pub-like establishment (Wanstead Tap, Winchelsea Road). 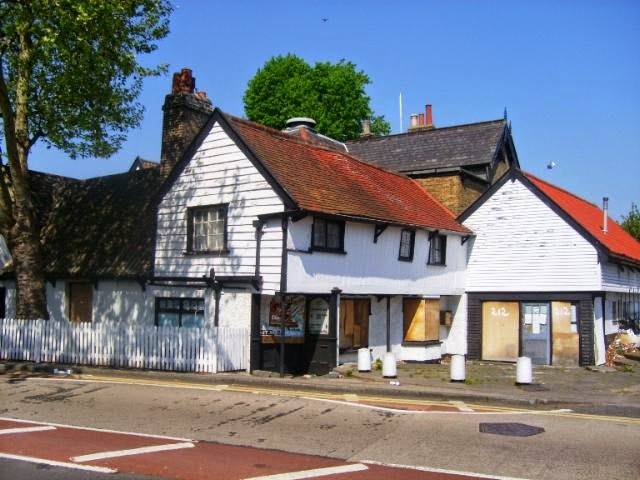 The Grade 11 listed former pub continues to be boarded up, and remains in the hands of a liquidator, who having held it for about seven years, is trying to dispose of the site. There have been some pre-planning application enquiries about using the car park area for residential accommodation, but these have not progressed. The liquidators have been helpful to the local campaign to save/reopen the pub, who report that, despite its outward appearance, it seems fairly watertight inside and not too structurally damaged. Previous squatters have been evicted and the site is reasonably well secured and patrolled. The Campaign held a well attended and successful public meeting in April this year and have been able to report interest from the Prince's Regeneration Trust, in helping them secure a community future for the pub. Realistically, it is going to take at least £2m to acquire and refurb the location, so the campaign group has set up a trust with a view to raising the money and seeking to get some building plans drawn up. Contact them for further details, and how to help and get involved. 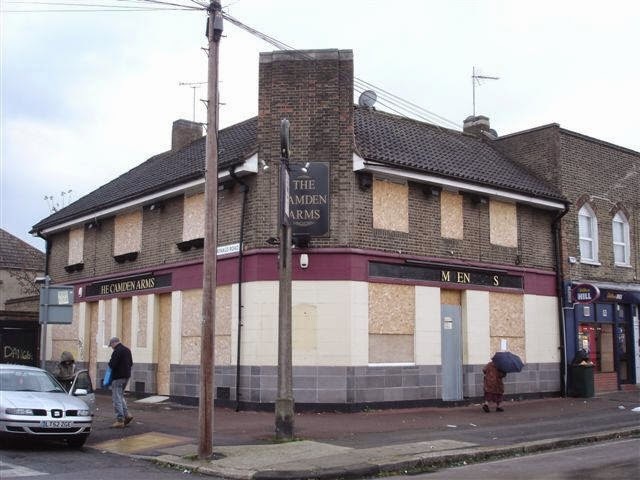 Meanwhile, this website provides details of additional, Forest Gate pubs, that have been closed over the last century, that did not feature in last year's listing, and provides further details and photographs of some of those already covered. Huge thanks to them for their painstaking work. The Builders' Arms, 47 Station Road, Forest Gate. There was a pub here, from at least 1874 until 1934. Its last recorded publican was Herbert Henry Webb. There are now garages, attached to flats built on the former pub site. Earl of Derby, Station Road, Forest Gate. The fate of this pub caused a little controversy following last year's posting, when we described it as having been subsequently tuned into a nursery. The photo below (thanks to Stephen Harris) confirms this fact. The pub was managed in the 1930's by former World Bantamweight Boxing champion, Teddy Baldock, who had to hand it back to the brewery during World War 11, when custom dried up. the Earl of Derby is now a nursery! Forest Glen, Dames Road. 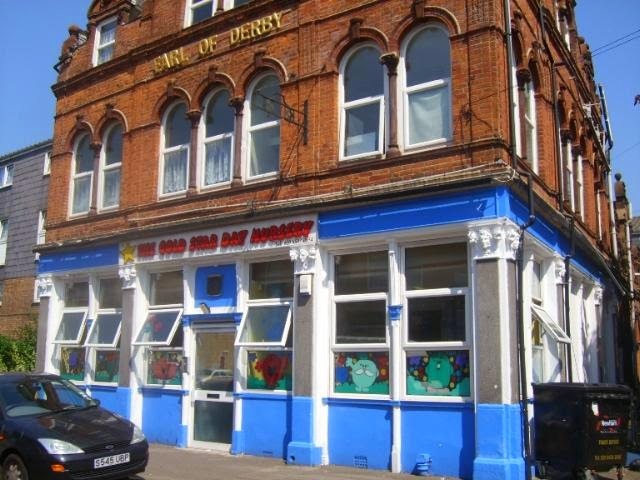 There has been little change from last year, as the pub still appears to be awaiting refurbishment into residential accommodation, and possibly a restaurant. The Globe, 40 Chestnut Avenue. There was, what must have been a small, pub on this site, according to trade directories from 1871 - 1886. The building remains, as a house. Golden Horse, 111 Forest Lane. A pub of that name was listed at this location in trade directories from 1861 - 1934, and continued until the 1950s. The pub and a large area of Odessa and Wellington Roads were bombed in the second World War, and prefabs and a prefabricated Golden Horse were ereceted on the site. They have subsequently been demolished ard the area is now occupied by St James' school playground. Jolly Smiths - Field Road. This pub existed between 1871 and 1885, until its publican, Edward Prince surrendered his licence to local magistrates. We don't have its exact location, unfortunately. Parliament House, 1 Parliament Place, which subsequently became 63 Forest Street, by the 1911 census. A pub of this name was located there from 1871 - 1944. For a lengthy time at the end of the nineteenth century it was in the hands of the Burren family, who were landlords of a number of pubs in Kent and elsewhere in East London. The site of this former pub is now occupied by part of Forest Gate Community School. The Plough, 55 Field Road. There was a pub here from 1871 - 1887. It is now the Al Dubbagh Indian restaurant and take-away. Prince of Wales, 58 Forest Street. A pub of this name was located here 1872 - 1886. The building has long gone and the site is now occupied by flats, behind Forest Gate Community school. Railway Bell, 129 Forest Lane, 1877 - 1886. This site is now residential accommodation. Travellers' Rest, 12 Cemetery Road. Thanks to Brian Berry for use of a photo of the most recent manifestation of a pub that had been on the site from 1871, until its recent transformation into flats. Well, that's this year's round-up. At the current space of developments, it is likely to need an update - and we hope a better news on -a year hence. 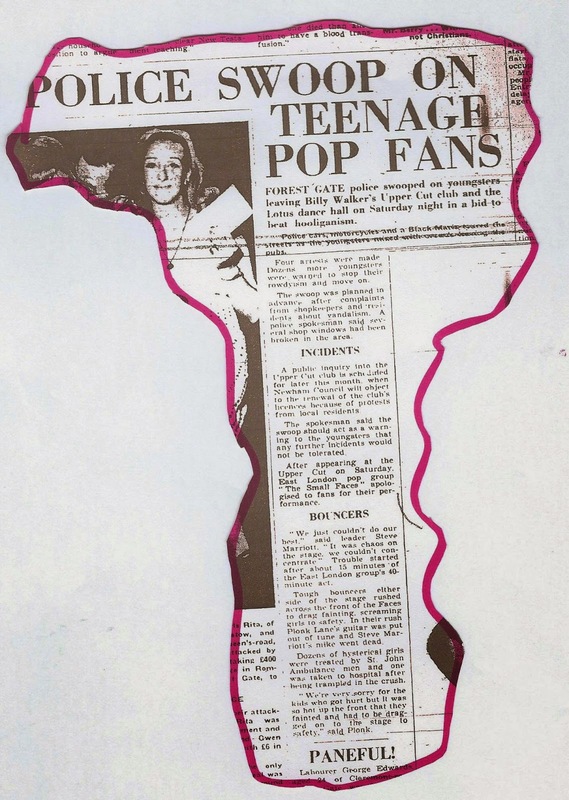 1967 has been labelled the Summer of Love, in the annals of pop music. Hippies, flower power, San Francisco nights, and the widespread emergence of hallucinogenic drugs within pop culture have characterised the era. 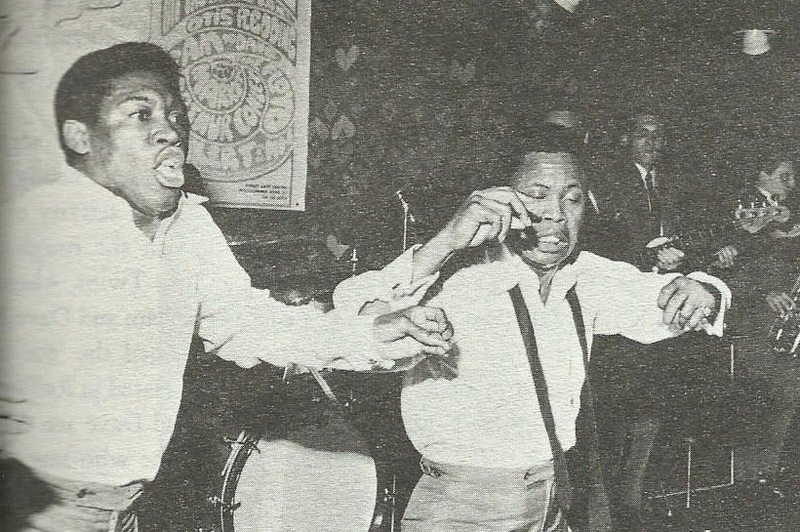 In this, the last of our monthly round-ups of Upper Cut gigs from 47 years ago, we have a brief look at how that summer played out in Forest Gate. For a full list and links to previous posts Upper Cut-related posts, see footnote. June and July were difficult times for the club. It faced an enquiry into renewing its licence, following complaints of late night rowdiness by patrons and anti-social parking. The months were relatively slack times at the Upper Cut, before it closed for a summer break. There was only one act of any significance in the first four weeks of June: The Turtles, who played the venue on the third. They were a short lived American rock band, who managed to move swiftly from folk, through folk rock to psychedelic within about five years. They first came to prominence in 1965 with a cover of Dylan's It Ain't Me, Babe, but had their biggest hit, just as they were appearing at the Upper Cut, with Happy Together. The Turtles folded in 1970, with a couple of their members leaving to join Frank Zappa in the eclectic Mothers of Invention. There was then a three week gap in Woodgrange Road's gig schedule, before a double header of two Black, all girl American groups: The Chiffons and The Toys, on 24 June. The Chiffons came from New York's Bronx and had been formed in 1960. They helped define the girl group sound of the time, and in many ways foreshadowed the later Motown greats. By the time they appeared at the Upper Cut, they had already had chart hits and a gold disc with He's So Fine, and Sweet Talkin' Guy, a few months before the Forest Gate outing. 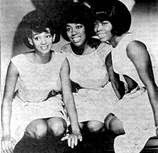 The core of the Chiffons broke up in the late 1960s, although off shoots continue to tour until today. The Toys also hailed from New York, were a short lived group. They disbanded the year after the Woodgrange Road outing, by which time they had already had their biggest hit A Lover's Concerto. 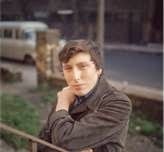 A week later, there was the return of Chris Farlowe at the end of the month( 30th). He had appeared only two months previously at the club a return doubtless encouraged by the popularity of this Islington soul/blues shouter. Then July. Only two gigs of note - but two of the most influential bands of the era - on successive Saturdays! The three piece band consisted of the mercurial Eric Clapton , who had already outgrown his stints with the Yardbirds and John Mayall's Blues Brakers, and Ginger Baker and Jack Bruce, who had emerged from the Graham Bond Organisation, which played the Upper Cut in May. Cream had just released Disraeli Gears by the time they appeared in Forest Gate, so doubtless Strange Brew and Sunshine of Your love got a good airing on the night. A number of sources claim the song's name is derived from the nickname of Little Ilford Park, on Church Road, in the London suburb of Manor Park, where Small Faces singer and song writer Steve Marriott grew up. The "Itchycoo" nickname is in turn attributed to the stinging nettles which grew there. Other sources cite nearby Wanstead Flats (Manor Park end) and Gardeners' Corner, Aldgate, as the inspiration for the song. Forest Gate police swooped on youngsters leaving Billy Walker's Upper Cut club and the Lotus dance hall on Saturday (the night of the Faces gig), in a bid to beat hooliganism. Local shopkeepers had complained of vandalism and residents of noise and parking disruption caused by the club's patrons. After appearing at the Upper Cut on Saturday ... the Small Faces apologised to fans ... 'It was chaos on stage. We couldn't concentrate', said leader Steve Marriott. Tough bouncers either side of the stage rushed across the front of the Faces to drag away screaming girls to safety. In their rush, Plonk Lane's guitar was put out of tune and Steve Marriott's mike went dead. Dozens of hysterical girls were treated by St John Ambulance men and one was taken to hospital after being trampled in the crush. 'We're very sorry for the kids who got hurt but it was so hot up the front that they fainted and had to be dragged to the stage to safety' said Plonk. This weekend marks the centenary of the outbreak of World War 1, and events of remembrance are being held, nationwide. These usually are occasions heavily imprinted with the message Lest we forget. About twenty varied war memorials were erected, after World War 1, in the Forest Gate area. As far as is possible to tell, about half of them have subsequently been lost or destroyed, as the following makes clear. The passage of time and changing religious affiliations account for most of the local losses. West Ham borough suffered 2,035 civilian and military deaths during the World War 1, the exact number of the Forest Gate death toll is not known. All Saints Church, Romford/Hampton Road junction. The church, has hosted two tablets, set on either side of main entrance. They list the 428 members of the congregation who served in WW1. There is also, apparently, a plaque to the right of the alter, near the small chapel, which reads: To the greater glory of God, the chancel screen as erected by the congregation to the undying memory of the men of this church who gave their lives for king and country. There were 58 names on the screen (whereabouts unknown), including 2nd Lt George Drewry. He was born in 1894 at 58 Claremont Road, and won his VC for his actions in the Battle of Gallipoli, in 1915. He was killed, accidentally, three years later. The church also displayed a 2' x 2' tablet, in honour of Drewry. Emmanuel Church, Romford Road.There is a bronze plaque, unveiled in 1922 (see photo) with the names of around 49 local servicemen/parishioners killed during World War1. The inscription reads: To the glory of God and in everlasting memory of the men from Emmanuel Parish who laid down their lives for king and country in the Great War 1914 -1918. It was dedicated on 5 Jan 1922 by the Bishop of Barking. The church also houses a wooden board, unveiled in 1956, with the names of 36 local service personnel and civilians killed in World War 11. 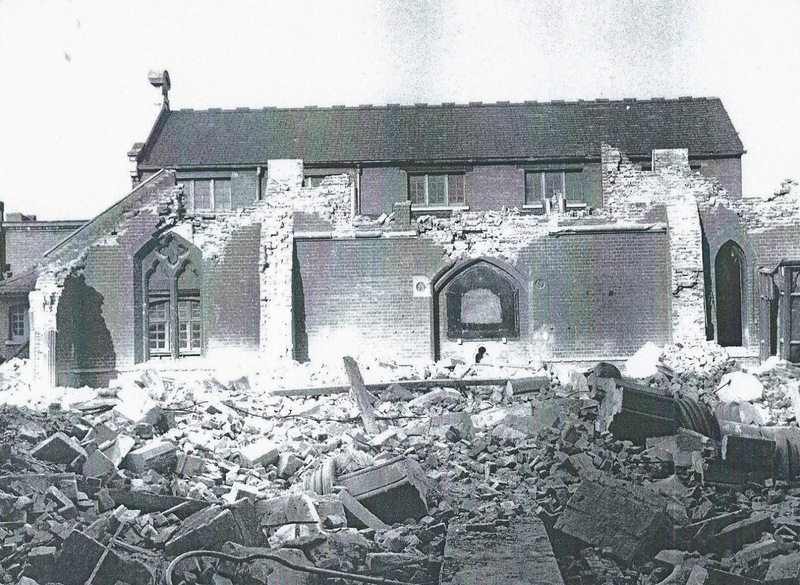 The nearby St Peter's Upton Cross church was demolished in 1972, and its war memorials - one for each of the 2 world wars were moved to its new "parent" church, Emmanuel. 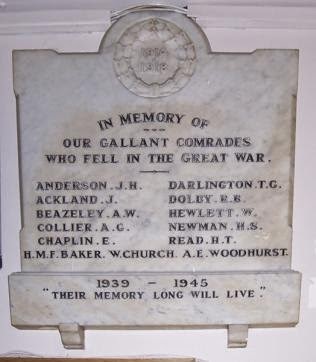 Although the Second World War plaque remains in its new home, the First World War monument - with 15 names on it -seems to have become "lost"
St Edmunds Church, Katharine Road. At one time hosted a screen and a plaque. The plaque reads: This screen is dedicated in memory of the men in this congregation who gave their lives 1914 - 1918. 66 names are listed. The screen may now be lost, as the plaque is mounted on an outside wall of the church. St James Church , Forest Lane. There was a memorial screen with the 148 names of the parishioners who perished in the First World War, and a chapel, in the church, with window dedicated to the fallen. These were unveiled on 13 November 1921 by Lt Gen Sir Francis Lloyd. 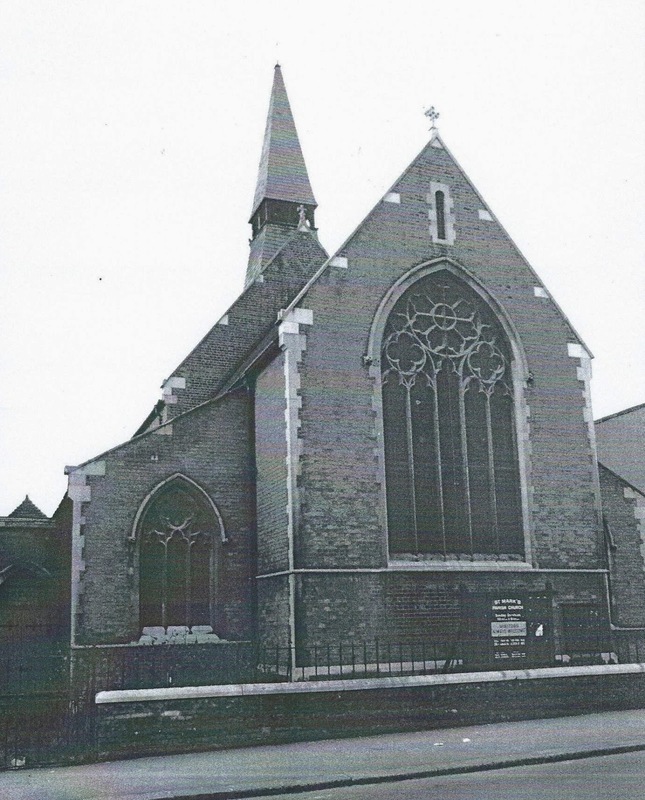 The church was demolished in 1964 (see photo)and it appears that nothing from the memorial and window was saved. 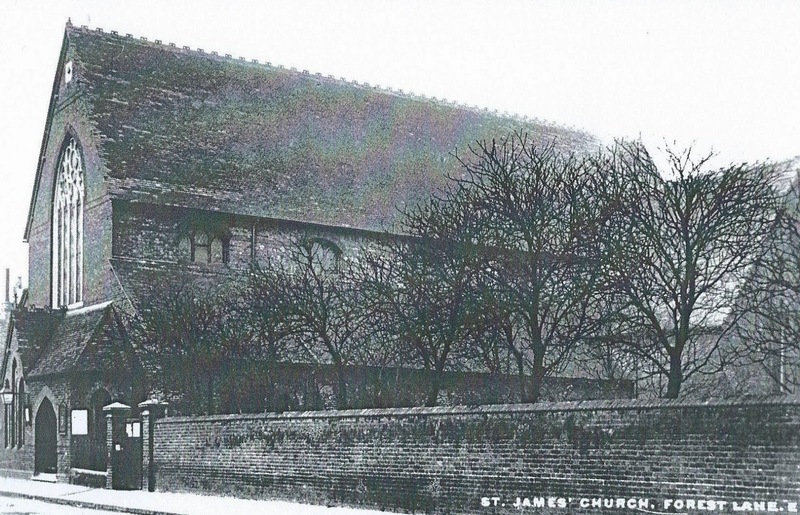 Former St James' church, Forest Lane. St Marks, Lorne Road hosts a parishioners' plaque, which was originally erected on the previous church (see photo) and moved when that was demolished, in 1985. The inscription reads In memory of those fallen in the war 1914 -1918 from this parish, and lists 44 names. The church also features a memorial window to the First World War fallen. It is in three sections; one depicting Christ crucified with two soldiers at his feet; to the left, a depiction of Mary; and to the right, one of St George. It was designed by Herbert Hendrie and unveiled by the Rev James Elphick in 1920. It, too, was moved to the new church when the old one was demolished. The previous St Mark's church, Lorne Road. St Saviours Church, Macdonald Road. The church was demolished in 1974. It had a roll of honour for the 134 parishioners who were lost in World War 1, with the inscription: To the glory of God and in undying memory of the following me from this church who died in the service of their country in the great war 1914 - 1918. Their names live for evermore Unfortunately not, however, as the memorial plaque has been subsequently lost. There was an associated Book of Remembrance in the church, listing the names. Its whereabouts is also unknown, as are a similar plaque and Remembrance Book to the World War 11 dead. West Ham Synagogue, Earlham Grove. A stone memorial (pictured) featured the 13 names of the congregation who perished in World War 1. 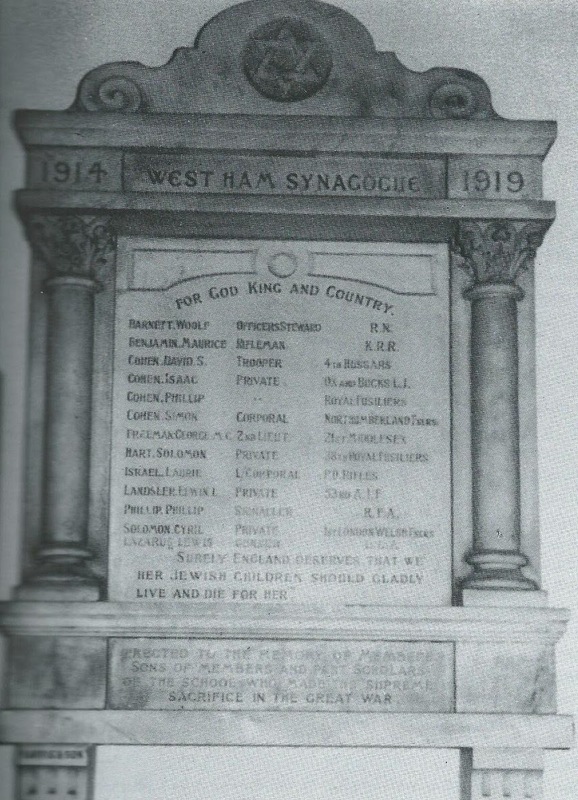 The inscription read: 1914 - 1919, West Ham Synagogue. For God King and Country (13 names). Surely England deserves that we, her Jewish children, should gladly live and die for her. Erected to the memory of members/sons of members and past scholars of the school who made the supreme sacrifice in the great war (see photo). A similar plaque with the World War 11 fallen was also erected. The Imperial War Museum believe that these memorials were destroyed when the synagogue was demolished, in 2005. Woodgrange Baptist Church, Romford Road. The church holds a memorial tablet, which reads: Lest we forget. To the memory of the following men connected with this church who laid down their lives in the great war 1914 - 1918. (27 names) Death is swallowed up in victory The tablet was placed in storage during redevelopment and part of the top and base were chipped. 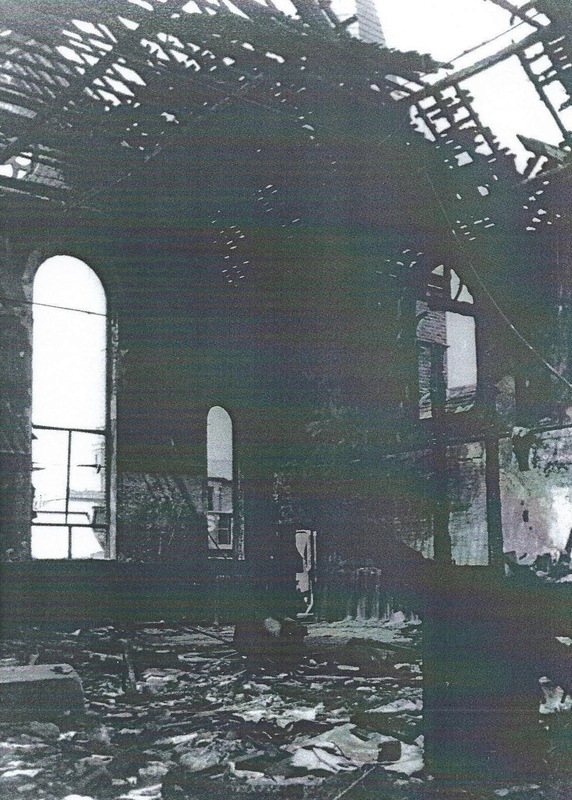 The Woodgrange Methodist Church on Woodgrange Road hosted a plaque of the 19 members of its congregation who were killed in action during the First World War, but this was, ironically, destroyed when the church, itself, was hit by an incendiary bomb on 3 December 1940 (see photo). In addition to the meticulously maintained, official Commonwealth War Graves Commission memorials in Woodgrange Park (187 remembered), Manor Park (168 remembered), West Ham and the City of London Cemeteries (see photos), there are a number of individual headstones to some of the World War 1 fallen in each of these cemeteries maintained to varying standards - universally poorly, in the case of the Woodgrange Park Cemetery. There are other WW1-related memorials of note within local cemeteries. Firstly, two Victoria Cross holders. Perhaps the better known is that of John (Jack) Cornwell (1900 - 1916), who was awarded his medal, posthumously for his bravery as a 16-year old at the Battle of Jutland. His memorial is in Manor Park Cemetery, (see photo). 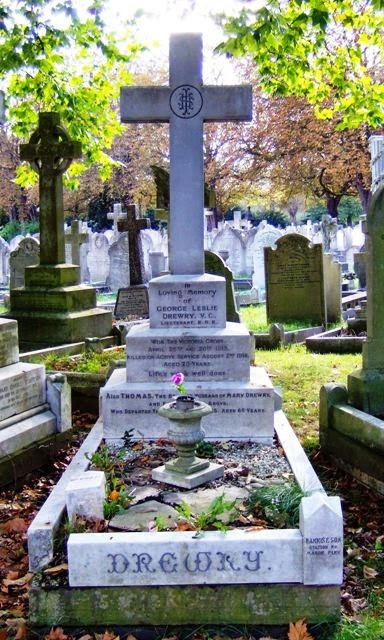 Second, Lt George Drewry There is a monument to him in the City of London Cemetery (see photo). He is also remembered in what was his local parish church, All Saints, Romford Road, (see above). Claxton Family. There is a memorial to this family in West Ham Cemetery, though none of those remembered on it is buried there. It does, however, throw into focus the devastating effect that the First World war had on many families. The inscription speaks for itself: In loving memory of Pte Benjamin Claxton, 13th Rifle Brigade, wounded in France August 21st Died Bangour military hospital Sept 10th 1918 aged 19. Pte Samuel Henry Claxton 2nd HAC, killed at Beaumont Hamel Nov 30th 1916 aged 26, interred at Beaucourt. Pte William Claxton 2/10th Middlesex. Reported missing, then killed in Palestine March 12th 1918 aged 27, interred at Bonn, Cologne. Sons of WH and RE Claxton "God is Love" Also Rev WH Claxton who passed on to a higher life on Nov 3rd 1935, aged 72 years. Cremated in Bristol. London County Westminster and Parrs Bank - later, Nat West Branch Forest Gate, 300 Romford Road. A bronze wall plaque was erected in the branch in 1920, as the bank did in all its branches who had a member of staff killed in the conflict. It read: In memory of the following member of staff of this branch who gave his life in the great war 1914 - 18 (name) There was only one name (unfortunately no longer known on it. The plaque was installed c 1920. The building is no longer a bank, or with public access. Osborne Road According to the Imperial War Museum (IWM), Osborne Road hosted a shrine on side of an unidentified building. It consisted of a three part arch, round headed, supported on pillars. It was an example of street memorials financed and erected by the former borough of West Ham, in memory of the victims of World War 1, and located throughout the borough. According to the IWM repeated whitewashings have obliterated the inscriptions. So much so, that the significance of the tablet may have been lost over time, and been subsequently removed or destroyed. There is no visible presence of it remaining. We would be delighted to hear from anyone with photographs of it, or knowledge of its fate and whereabouts. Royal Mail Sorting Office, Earlham Grove. 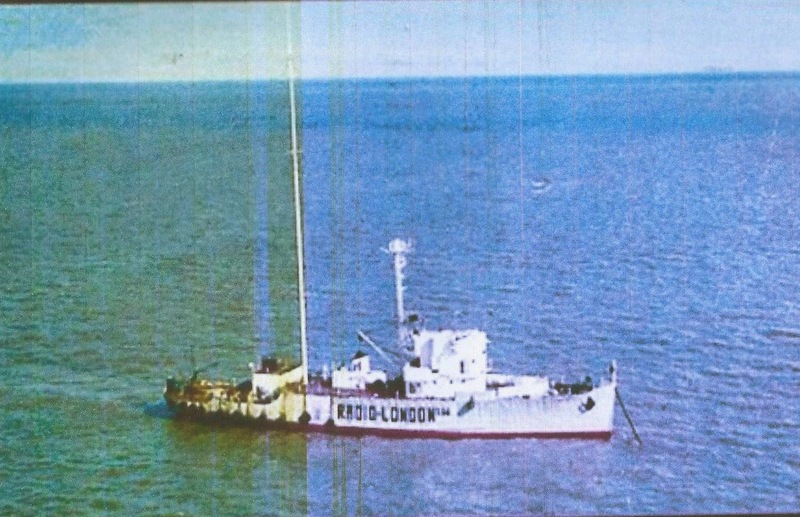 Thanks to Carol, in the comments, below, for drawing our attention to this memorial, and to Paul Holloway for pointing us to the Royal Mail Memorial Database. Below is a photo of this memorial, at 199 Earlham Grove. It is wall mounted in the sorting hall, and not accessible to the public. It reads: In memory of our gallant comrades who fell in the Great War, and then lists the names. There is an additional small plaque, attached to the bottom of it, dedicated to the memory of those who died in WW11. Footnote. We are indebted to the Imperial War Museum for much of the detail contained in this blog. The relevant section of their website can be found at: www.ukniwm.org. Any corrections to the text, or up-to-date photos or sightings of any memorials mention, will be gratefully received. They will be added to this post, and where relevant, forwarded to the Imperial War Museum, for their definitive records index and database.